HTC to return to tablet fray with Flyer 2? 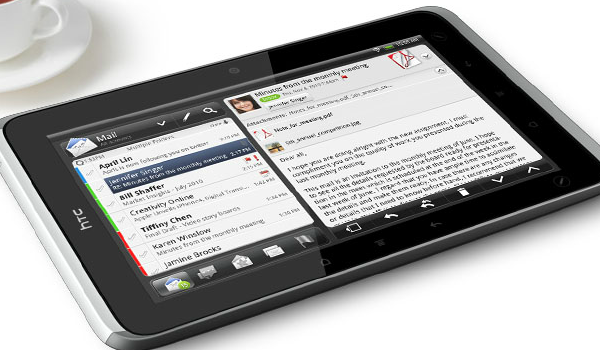 HTC is rumored to dip their toes back into the Android tablet waters as word of a Flyer 2 have started circulating. According to an anonymous PhoneArena source, HTC is readying an Android 4.1 Jelly Bean tablet with a Snapdragon S4 processor, 7-inch (1280×768) display, a 3-megapixel rear camera, and 1-megapixel front-facing camera. The next-generation Flyer is said to feature an anodized aluminum body, much like the HTC One S.
It’s possible that HTC might announce the tablet at their September 19 event, however we’ve got nothing solid that say they will for certain. Looks like we’ll just have to wait it out, eh? In the days of the Kindle Fire, Nexus 7, and Kindle Fire successor, consumers are going to expect a low-cost Android tablet. Anything about $249 and HTC might as well forget about it.